Applied Anatomy and Biomechanics in Sport, Second Edition, offers a variety of information for coaches and sport scientists that can be integrated and applied to the elements of body structure, body composition, assessment, physiology, and biomechanics. 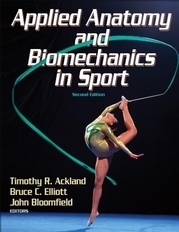 Applied Anatomy and Biomechanics in Sport, Second Edition, concentrates on the various ways in which an athlete—whether the average participant or the elite competitor—can modify technique to achieve optimal performance. Its emphasis on athletic assessment and physical capacity modification provides a unique perspective that will help coaches and other sport professionals appraise the body structure of their athletes so that strengths can be fully utilized and weaknesses improved. The text also considers growth, development, and gender, and it makes readers aware of mechanical overstresses that can impair performance and cause injuries. the application of proportionality and posture to sport performance. Applied Anatomy and Biomechanics in Sport relies on current research findings and proven methods in developing physical athletic performance to help readers learn to recognize and use appropriate methods to develop optimal physical qualities for skilled performance. The text categorizes 30 international sports into nine distinct groups organized by common features: racket sports; aquatic sports; gymnastics and power sports; track, field, and cycling; mobile field sports; set field sports; court sports; contact field sports; and martial arts. Within each group, techniques that improve performance are analyzed with specific examples given from a variety of international coaches. Fundamental Concepts relate to assessment and modification of an athlete’s body structure, physical capacity, and technique, as well as talent identification and profiling. Applied Anatomy provides both a theoretical framework for valid and reliable assessment and evidence-based modification of an athlete’s body structure and physical capacity. Applied Biomechanics explains how the analysis of sport technique may be used to improve athletic performance. A Practical Example uses in-depth analysis to provide a specific case for assessment of physical capacity and biomechanics of an athlete, the intervention program and technique modification employed, and the resultant influence on the athlete’s performance. Applied Anatomy and Biomechanics in Sport covers the latest assessment techniques used by exercise and sport science specialists to evaluate human physiques, physical capacities, and sport techniques. Using this text, readers can integrate and apply the elements of body structure, body composition, assessment, physiology, and biomechanics to assess current capabilities and enhance the performance of athletes. Why is Maximal Power Important? Does Stretching Help Improve Sport Performance or Reduce Risk of Injury? How do you Measure Improvement in Flexibility? A textbook for students enrolled in sports science curriculums who have already completed a structural anatomy course, including future physical education teachers and coaches. A reference for coaches, physical education teachers, and sport scientists with an interest in studying components of athletic ability. Timothy R. Ackland, PhD, is a professor of functional anatomy and biomechanics in the School of Exercise, Sport Science, and Health at the University of Western Australia. His research interests include the mechanics of human movement with themes spanning exercise rehabilitation, high-performance sport, and human performance in industry. Dr. Ackland has published more than 70 peer-reviewed papers as well as three academic books and 20 book chapters. Currently, Dr. Ackland is a director of Sports Medicine Australia and is on the review boards of four international journals. He recently served as the scientific chair for the fifth IOC World Congress on Sport Sciences for the 2000 Sydney Olympics and as the 2001 conference cochair for Sports Medicine Australia in Perth. Since 1991, he has been the principal of Ackland Marshall and Associates, Ergonomics Consultants. Bruce C. Elliott, PhD, FACHPER, FASMF, FISBS, FAAKPE, is the senior biomechanist and head of the School of Human Movement and Exercise Science at the University of Western Australia. He has a keen interest in performance optimization and injury reduction in sport and has published more than 170 refereed articles, 50 refereed conference proceedings, and 40 books or book chapters in this general area. He is an editorial board member of Sports Biomechanics, Journal of Applied Biomechanics, Journal of Sports Sciences, and the International Journal of Sport and Health Sciences. Elliott is a sought-after international speaker on the application of biomechanics to sport. He was the keynote speaker at the first World Congress on Racket Sports, the first World Congress of Cricket, and the third World Congress of Medicine and Science in Tennis. A fellow of the International Society of Biomechanics in Sports, Sports Medicine Australia, and the American Academy of Kinesiology and Physical Education, he was also the inaugural chair of the Western Australian Institute of Sport and inaugural vice-president of the Australian Association of Exercise and Sport Science. In addition, Elliot served as the scientific chair for the fifth IOC World Congress on Sport Sciences and was the organizer of the research projects at the Sydney 2000 Olympics. He was the president-elect of the International Society of Biomechanics in Sports and sits on the coaching advisory panel of Tennis Australia and the research board of Cricket Australia. John Bloomfield, PhD, is an emeritus professor at the University of Western Australia and a former director of the Hollywood Functional Rehabilitation Clinic at Hollywood Private Hospital in Perth. He left Australia in 1960 on a Fulbright scholarship to pursue postgraduate study at the University of Oregon in the United States. After receiving his PhD in 1968, he returned to Australia to take a position at the University of Western Australia. Throughout his notable career, Bloomfield has served as president of Sports Medicine Australia, chairman of the Australian Sports Science Council, chairman of the Australian Institute of Sport, and cochairman of the Australian Sports Commission. He has authored more than 100 scientific papers and five books in sport and sport science as well as three major government reports on the development of sport in Australia. He was a National Surf Lifesaving champion and elite-level swimming coach in Australia and the United States. Bloomfield's research interests and experiences have led him to be a highly regarded lecturer and consultant in 22 countries. In 1979, Bloomfield was awarded Citizen of the Year in Western Australia and, in 1982, he received Member of the Order of Australia. Test package. Created with Respondus 2.0 and features more than 300 questions in multiple-choice format. Instructions for downloading a free version of Respondus are included. Image bank. Features hundreds of full-color PowerPoint slides that contain most of the figures, content photos, and tables from the text, sorted by chapter. The images can be used to develop a customized presentation based on specific course requirements. A blank PowerPoint template is also provided, along with easy-to-follow instructions for quickly creating a presentation.